NAT 44 and NAT 66 stats center. 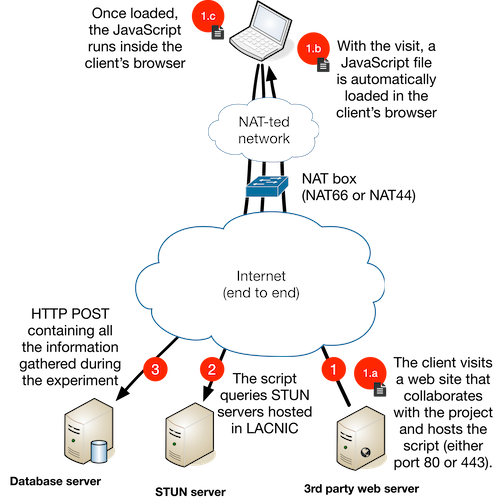 NAT (Network Address Translation) is a widely Used on the Internet where the IP address has traditionally been modified Source of a datagram in such a way that said packet can be routed in This mechanism in the world of IPv4 allows significant savings of IP addresses. On the other hand, IPv6 is a protocol that is characterized by its Vast amount of IP addresses which has resulted in There is a hypothesis that NAT is no longer necessary and will disappear without However, both IETF, the Open Source world and software companies have already Created the mechanisms to perform NAT in IPv6 or a similar mechanism Called NPT (Network Prefix Translation). Get to know NAT 44 and NAT 66 deployment in the LACNIC region. Some charts based on the collected data. In this section you can see a small demo showing the script in action. When an Internet user wants to open a Web page that collaborates with This project (for example the home of LACNIC), your web browser will Silently and transparently connect to a STUN / TURN server where You can identify with which addresses (IPv6 and / or IPv4) you are navigating in This information will be stored in a LACNIC database.